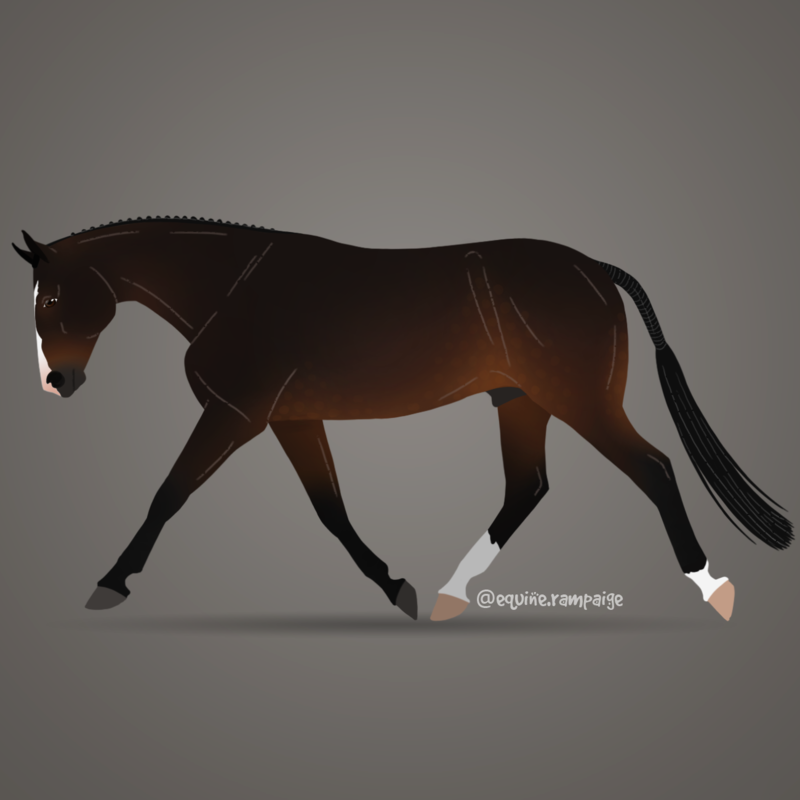 If you follow a lot of horse themed instagram accounts, you have probably seen at least a few accounts dedicated to digital equine art. I follow a few, and I always think they are SO CUTE. One account in particular kept catching my eye (@equine.rampaige) and I found myself frequently liking and commenting on her work. On a bit of a lark, I decided to DM her and see what the price of a commissioned piece would be. $27. SOLD. You get a pic with and without tack for that price, and you can describe the pose you want. She is very thorough, and asks for close up pics of your tack, so as to get the details accurate. She didn’t need pics of Rio (she just used my IG account and blog for reference) so it was super easy to organize. Took maybe 5 minutes to get the pics to her and pay the PayPal invoice. Then I waited as eagerly as a kid on Christmas morning. She had quoted me a week turnout time, but totally surprised me by having it ready the next afternoon. I started laughing/giggling/ooohing manically as soon as I opened the e-mail. It was BETTER then I could have hoped for. I love it so much, I have no words. So adorable. So RIO. I mean, maybe could have added a smidgen to his ears… but we don’t want him looking like a mule! Definitely $27 well spent because it has made me so happy. I’ll just skip the next few Starbucks cravings and call it good! One day, I’d love to get an actual painting of Rio done. Unfortunately, all my favorite artists (Joanna Zeller Quentin & Julie Ferris) do not come inexpensively, so I’ll have to save up for that little venture. Someday! Anyone else ever have any art commissioned of your horse? Very cool, I prefer the one without tack. SO CUTE!!! That’s a great price point, and you get TWO! I love these digital drawings so much. I got one done from @artastride of my Rio and it came out great! I’ve had horses drawn before but never painted. Deb Sampson (she’s on instagram @debsampsonhorsepetartist draws horses, and has pretty reasonable prices. She did my horse Bud for me and Rio too.